Pew Research Center’s political typology divides the public into eight politically oriented groups, along with a ninth group of politically disengaged Bystanders. Although the partisan divide on political values is now wider than at any point in the past two decades, significant divides in values are evident within both the Democratic and Republican coalitions. The political typology is designed to understand these intraparty schisms and illustrate how different sectors within each partisan coalition differ in their participation in politics and in other aspects of American life. The current political typology is the seventh of its kind, following on previous studies in 1987, 1994, 1999, 2005, 2011 and 2014. This year’s typology segments people based on a combination of 12 political values and beliefs as well as partisan orientation. Take the quiz to find where you fit in the political typology. 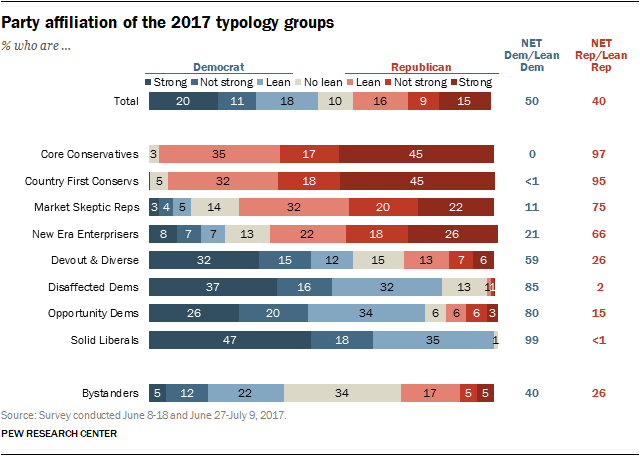 This year’s typology identifies four Republican-oriented groups and four Democratic-oriented groups. In both coalitions, the most deeply partisan and ideological groups, Solid Liberals and Core Conservatives, also are the most likely to vote, to pay attention to politics and to be invested in the outcome of the 2018 congressional elections. In addition to being the most likely to say they always or nearly always vote, these highly partisan ideological groups also donate money, contact elected officials and discuss politics with others at the highest rates. Far more Solid Liberals say they engage in these activities than do members of other typology groups, including Core Conservatives. By contrast, political engagement is lowest among some of the groups with the most mixed political values. Devout and Diverse, in particular, stand out for their general low level of attention to public affairs. New Era Enterprisers, Market Skeptic Republicans and Disaffected Democrats also express less interest, and vote at lower rates, than other groups. Among the four Republican-oriented groups, Core Conservatives and Country First Conservatives stand out as the most partisan and ideological: Nearly all in both groups (97% and 95%, respectively) identify with or lean toward the GOP, and fully 45% in both groups consider themselves to be strong Republican identifiers. Wide majorities of both groups (81% of Core Conservatives and 70% of Country First Conservatives) identify themselves as politically conservative. While both groups share a deeply critical view of government and a desire for smaller government and less regulation, they differ in other key political values. Core Conservatives are strong backers of business and believe that the economic system is fair; Country First Conservatives are more divided in these assessments. Conversely, while Country First Conservatives are very socially conservative and couple strongly negative views of immigrants with a skepticism about American involvement in the world, Core Conservatives are split internally over each of these values. While the two other, less traditionally conservative groups in the GOP-oriented coalition – Market Skeptic Republicans (75% Republican/lean Republican) and New Era Enterprisers (66% Republican/lean Republican) – are also mostly Republican in their orientation, only about a quarter in each of these groups consider themselves strong Republicans. Those in these less politically engaged and younger GOP-oriented groups also tend to hold more ideologically mixed values than Core and Country First Conservatives, though in markedly different ways. Market Skeptic Republicans express generally negative views of immigrants and a desire for the country to be less focused on foreign affairs, but they are otherwise somewhat less socially conservative than Country First Conservatives. Their economic attitudes – skepticism about the fairness of the economy and a generally negative view of banks and business –distinguish them from Core Conservatives. By contrast, the other ideologically mixed group in the Republican coalition, New Era Enterprisers, are in many ways economically aligned with Core Conservatives, expressing some of the most positive views about the U.S. economic system of any typology group. But this group’s views on immigration, the environment, foreign policy and homosexuality are more in line with those of most Democratic groups. Solid Liberals anchor the Democratic coalition, as similar groups did in 2014 and 2011. Those in this group take liberal positions across nearly every domain – including government, the economy and business, race, gender and immigration. They also think the U.S. should be active in world affairs. Solid Liberals are highly engaged and intensely partisan: 99% affiliate with, or lean to, the Democratic Party, including 47% who describe themselves as strong Democrats. About seven-in-ten (71%) describe themselves as liberal; by comparison, no more than a third of those in any other typology group call themselves liberal. Opportunity Democrats, who are 80% Democratic or Democratic-leaning, are in broad agreement with Solid Liberals on most political values. However, particularly on questions about economic opportunity, they hold less uniformly liberal stances than Solid Liberals and a plurality (46%) call themselves moderate. Disaffected Democrats similarly are more likely to call themselves moderate (44%) than liberal (30%), even as 85% identify with or lean to the Democratic Party. Generally in alignment with Solid Liberals on most political values, this group diverges from them in their skepticism about government. In contrast to Opportunity Democrats, Disaffected Democrats are more critical in their views of the economic system broadly, including U.S. involvement in the global economic system. The final group in the Democratic coalition, Devout and Diverse, is the most politically diverse group in the typology: 59% are Democrats or lean Democratic, while 26% are Republican or lean Republican. Most of those in this majority-minority group hold liberal values about the social safety net and racial issues. But Devout and Diverse part ways with other Democratic-oriented groups in their isolationist views of foreign policy and are far more mixed than these other groups in their views about immigrants, environmental regulation and homosexuality. Among the public overall, 59% say they follow what’s going on in government and public affairs most of the time. The share rises to 82% among Solid Liberals and 80% among Core Conservatives. Roughly six-in-ten Country First Conservatives (60%) and Opportunity Democrats (63%) say they follow what’s going on in government most of the time. 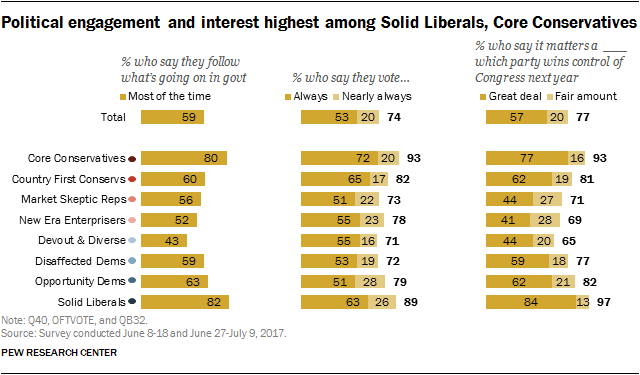 Attention to politics and government lags among the other typology groups; no more than six-in-ten in any other group say they follow government most of the time. Devout and Diverse are least likely to say this (43%). Views about the importance of the outcome of next year’s congressional election follow a similar pattern. Nearly all Solid Liberals (97%) say it matters at least a fair amount who wins control of Congress in the 2018 elections (including 84% who say it matters a great deal), while Core Conservatives also express high levels of investment in the outcome (93% say it matters at least a fair amount). 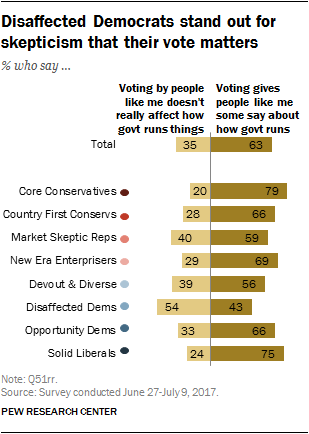 Narrower majorities of all other groups say control of Congress matters at least a fair amount, and fewer than half of Market Skeptic Republicans, New Era Enterprisers and Devout and Diverse say partisan control of Congress matters a great deal to them. Although Solid Liberals and Core Conservatives are roughly equally likely to express broad interest in politics, Solid Liberals stand out for their political activism over the past year, particularly since the 2016 election. Fully 39% of Solid Liberals say they have attended a political event, rally or organized protest since the 2016 election, making them about twice as likely as any other typology group to have engaged in this kind of political activity. This high level of political engagement since Donald Trump’s election is also reflected in Solid Liberals’ comparatively higher reporting of other political activities over the last year: 59% of Solid Liberals say they have contacted an elected official, 49% say they have contributed money to a candidate and 19% say they worked or volunteered for a political candidate over the past year. They are significantly more likely to report engaging in each of these activities than other political typology groups. While Core Conservatives report these types of political behaviors at lower rates than Solid Liberals, they are more active than most other groups. Aside from Solid Liberals, Core Conservatives are more likely to make financial contributions to campaigns (32%) than the other typology groups and also to report contacting elected officials at relatively high rates (38% say they have done so over the past year). 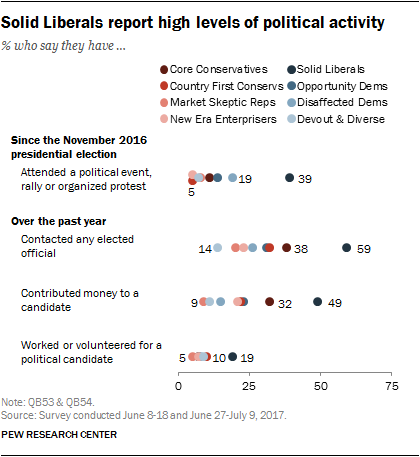 The current activism gap between Solid Liberals and Core Conservatives is wider than the gap seen in the 2014 Political Typology between Solid Liberals and the two most politically engaged GOP-oriented groups at that time (Steadfast Conservatives and Business Conservatives). As is the case with their overall measures of interest and engagement with politics, Devout and Diverse and Market Skeptic Republicans are among the least likely to engage these types of political activities. Among the public overall, roughly half (52%) say they are paying more attention to politics since Trump’s election, a third say they are paying the same amount of attention and 13% say they are paying less attention. 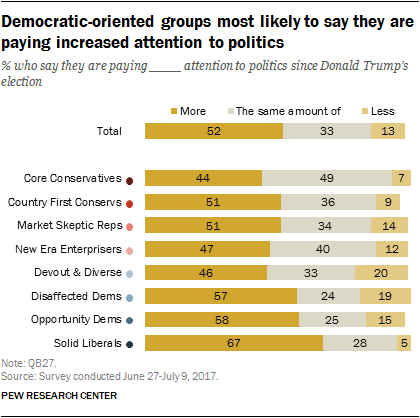 While about half of most typology groups say they are paying more attention than they used to, the share reporting increased attention is higher among three Democratic groups: Disaffected Democrats (57%), Opportunity Democrats (58%) – and particularly Solid Liberals, two-thirds (67%) of whom say they are paying more attention than in the past. Though majorities of most groups say voting gives them a voice in how government runs, Core Conservatives and Solid Liberals are the most likely to think this (79% and 75%, respectively), paralleling their relatively high levels of political engagement. Though Disaffected Democrats’ political engagement is on par with other middle typology groups, this group stands out for its comparatively low sense of political efficacy: Just 43% say that voting gives them a voice in how government runs, while 54% say that voting by people like them doesn’t really affect the way government works.